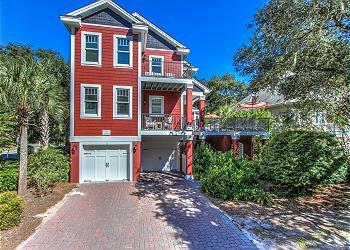 Enjoy this dramatic, funky, and fun 4 Bedroom, 4.5 bath beach house with *heated pool and spa. Located 3rd row from the ocean in the fabulous Forest Beach area, this Key West style house is the perfect family vacation getaway plus it’s *dog-friendly. Upon entering you will find a fully-equipped wet bar/kitchen, den, and access to the upstairs master bedroom. The master bedroom with private bath offers the most in privacy from the rest of the house. Through the front den are an updated kitchen, dining room, and living room with a flat-screen television. Decorated in bold jewel tones this living area has access to the swimming pool on one side of the house and a screened-in porch complete with rocking chairs on the other. A 6-burner gas grill on the screened porch will tempt the chefs in your group to show off. Back inside and up the circular staircase, you will find 3 more bedrooms with private bathrooms. One queen suite and two bedrooms with 2 twins in each. 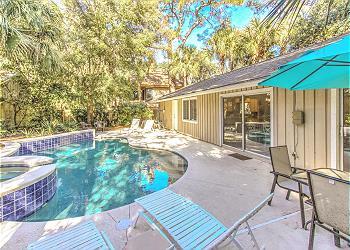 This home is one of our fantastic and jazzy South Forest Beach rentals. •	Private *Heated Pool (12 x 24) *This pool & spa have an electric heat pump. The pool & spa can be heated for an additional fee of $300 + tax per week. •	**This house is dog friendly with $300 non-refundable pet deposit - Please inquire when making your reservation. Certain restrictions do apply.